The perfect picnic menu combines elegance with ease and delicious food that you and your companions will enjoy. Plan ahead, scout out great recipes, and use these tips to create a picnic menu your guests will love. The elements of a perfect picnic menu begin and end with the guests. Consider first the tastes of those who will join you for your picnic. If you're entertaining a friend whose idea of gourmet fare is hotdogs and beer, then your picnic menu should err on the side of simple, flavorful, common picnic food. On the other hand, if you're trying to impress your latest beau, go for a romantic menu full of elegant foods such as a salad of baby greens, a delicious dip, or gourmet sandwiches. Before trying any of these menus, be sure you have a good cooler or ice chest and freezer packs. Nothing spoils the perfect picnic as much as food poisoning. Keep food very cool and eat it quickly after transporting it to the picnic site. Elegant dishes, whether disposable or reusable, also set the mood and tone. While a checkered tablecloth is the quintessential picnic accessory, any lovely cloth to spread on the table or ground sets the mood too. Beverages: Classic picnic beverages include freshly made lemonade, homemade iced tea, flavored iced tea, or a good wine. Keep it chilled and pour non alcoholic beverages into a good quality thermos filled with ice for a refreshing cold drink. Appetizers or snacks: Elegant finger foods such as salsa keep longer than dairy-based dips like onion dip filled with sour cream that can spoil in summer's heat. Be sure to include quality crackers or sliced crudités that go with the dip of your choice. Main dishes: Midday menus call for sandwiches such as grilled chicken with pesto or perhaps eggplant burgers. For evening picnics, try quiches, tarts, or cold fried chicken as the main dish accompanied by a green salad. Dessert: Think about desserts that are easy to transport and handle. Cookies can be packed separately and as long as there's no chocolate to melt in the car, can be kept out of the cooler, leaving room for other foods. Cupcakes, a good cake, or a simple pie work well too. Don't forget watermelon, the classic summer picnic dessert! The following sample menus can help you create the perfect picnic menu on your own. 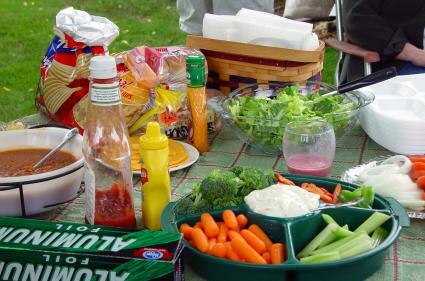 You can also cook picnic items on site if the picnic area includes a barbecue grill. Be sure to bring extra charcoal briquettes and leave plenty of time to cook the food thoroughly. Transport hamburger patties, hot dogs and other perishables in a good quality cooler and keep them cold until ready to cook. Don't forget sides to cook too, such as baked beans which can be easily heated up on the grill or corn on the cob to grill. Pack desserts in the cooler and serve pies, cakes and watermelon to accompany your feast. You can find more recipe ideas and food ideas too for hot and cold picnic foods to expand and enhance these sample picnic menus.